About 90 minutes drive from Kansai International Airport and 60 minutes drive from Osaka Airport. We offer breakfast only if you choose a breakfast plan when making a reservation. How do I get to your ryokan hotel? Please refer to "Access" page. Definitely.... all rooms and the lobby are air conditioned. On your website, I see two different choices, "Oyado Ishicho" and "Ishicho Shogikuen". What are the differences? Two towers at the Kyoto Ryokan Hotel "Ishicho", "Oyado Ishicho" and "Ishicho Shogikuen", are almost similar in their feature, same facilities and same amenities. The slight differences are the room size and the price. 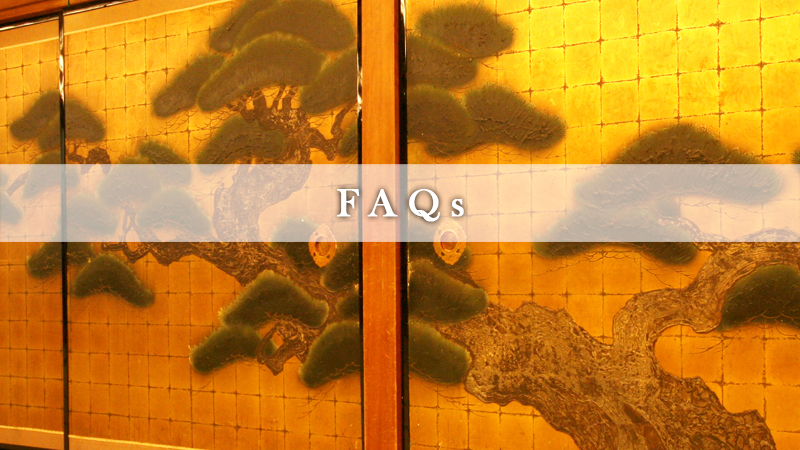 Even though the rooms at both towers are 10 tatami-mats size, the total room size including bath room at "Oyado Ishicho" is 26 square meter whereas "Ishicho Shogikuen" has 30 square meter in its total room size. The rates are different, too. The rate per night for one person at "Oyado Ishicho" in regular season is 20,000yen, and that of "Ishicho Shogikuen" is 25,000yen. Both towers are connected with an underground passage and you can use facilities at the another tower. Does the prices on your website include the meal? No. The room rate shown on the Online Reservation page doesn't include a cost for meals. You will need to pay additional fee for the meals. The fee depends on what meal plan you choose. Can I chose to have breakfast only or can I chose to have dinner only? Yes, you can reserve only a breakfast plan, only a dinner plan, both, or no meals. What time do you serve breakfast and what time do you serve dinner? We serve breakfast between 7:00am and 8:30am and dinner between 6:00pm and 7:30pm. Both breakfast and dinner will be served in the banquet hall. Is it possible to have a meal on just one or two days or do we have to select a plan for our entire stay ? You don't need to have a plan for your entire stay. You can reserve a meal plan any day you want. However, please make sure that we may not prepare for your meal unless you make a meal reservation 3 days before arrival. I would like to reserve a room with windows. Every room both at "Oyado Ishicho" and "Ishicho Shogikuen" has windows. Yes, we have an individual bathroom and toilet in every room at both "Oyado Ishicho" tower and "Ishicho Shogikuen" tower.